I just wrote to Kindle Feedback (kindle-feedback@amazon.com) sharing my recent experience with Kindle devices released September 2012 (Kindle Fire HD, $69 Kindle, Kindle Paperwhite 3g). Here’s that Kindle feedback, in case it’s useful to others. I have owned each Kindle sold with the exception of last year’s $79 basic Kindle and the Kindle DX. I enjoy using Kindle products because Amazon offers the best selection, pricing and customer service around. Bought the 16GB and found it too small (I’m a big audiobook fan), so returned it and am now awaiting the 32GB. It’s the 1st tablet that offers equal support for audiobook listeners. Immersion reading: I initially pooh poohed this as a marketing stunt but it’s fabulous! After a long day at work, I can read and listen to the book at the same time… it’s a lovely experience. I can watch all my favorite videos on the HD via Amazon streaming (including instant prime), Netflix, Hulu Plus. The volume is crazy loud. I’ve never had a tablet that was loud enough to watch a movie while giving the dog a bath… until the Fire HD! As an audiobook fan, I love that I can start listening to a book while out walking the dog and then come home and read the (text) book. THANK YOU for your aggressive pricing on Whispersync deals: I’ve bought many Kindle books + the Audible.com audio version as part of a whispersync promotion for less than the price of the hardcover book! I really appreciate that, as someone who loves to read (and reads alot). This Kindle is an amazing value. It is unfortunately dismissed by some as “low end” but I think it’s the best Kindle Amazon has made. It’s light and comfortable to hold. Even with the lighted cover, it’s still light and comfortable to use. The control buttons at bottom are black so they fade into the device (not a distraction). The text is very crisp and bold — easy to read. The page buttons are comfortable and well placed. This kindle is an absolute joy to use — it makes reading comfortable and the device itself doesn’t interfere with the experience — in fact, the $69 kindle hardware enhances the reading experience. I only wish you offered a 3g version of the $69 Kindle, as well! The form factor is lovely — perfect size and weight. I love the textured screen, makes it seem more like reading paper pages. The 3g works very well. The Paperwhite cover is fantastic — love how it puts the device to sleep. The 1st Paperwhite I received was clearly defective (the entire right side of the screen was much brighter than the left). I appreciate Amazon’s responsiveness and how quickly a replacement was sent to me. Unfortunately, this is the 1st Kindle product I’ve felt disappointed in — I am assuming my replacement Paperwhite is “normal” but there is still variation in light intensity *within the text area*. If the lighting variations were just in the margins they’d be less distracting. The variations in light intensity (within the text area) make the text on a given page appear uneven — some words appear bolder/clearer than others. Rather than just settling in to read, I find myself fiddling with the light setting to get it bright enough to illuminate the text while trying to keep the light setting low enough to minimize light variations inherent in the screen. There you have it, a wrap up of my experience with most Kindles released September 2012. If you have any questions, please leave a comment. Like many geeks, er technophiles, I recently bought an HP TouchPad at fire sale pricing. I bought it partly because it was a great tech buy, and this article describes what I like about it, as well as webOS apps I’m enjoying. Once upon a time, in a decade not so long ago (the 90s), I received a Palm Vx for Christmas. Suddenly, I could have my calendar and contact list me wherever I went. I could sync my device with AvantGo content and read news articles while I waited to get my allergy shots. I loaded Peanut Press books onto my Palm Vx and caught up on my reading while waiting in line at the grocery store. The Palm Vx was small. It was stylish. Palm Computing (division of 3Com) had made other PDAs but none so svelte and pocketable. I’ve had many PDAs and smartphones over the years, but none evoke the delight I felt using the Palm Vx. I dutifully tucked it into its desktop dock to charge every evening, and never left the house without it. It became my first experience of ubiquitous computing, despite the fact that it didn’t directly connect to the Internet. When HP bought Palm in 2010, it seemed promising. Finally, the Palm brand would be nurtured. Alas, that was not to be. In August 2011, HP announced it would no longer manufacture webOS devices, including the TouchPad, Pre 3, and Veer. And so, when HP announced its TouchPad fire sale pricing ($99 for 16GB, $149 for 32GB), I knew I had to get one. After all these years, what did I think of the current version of Palm OS (now webOS)? And, like Palm OS of years past, there’s a vibrant and committed webOS community. And the TouchPad? With its webOS underpinnings, it’s probably the best tablet I’ve used, and I’ve tried them all! While heavier than the iPad 2, its softly rounded edges make it comfortable to hold and use. Docked in its Touchstone, it’s easily accessible and comfortable to use at one’s desk even while charging. It’s plenty speedy after applying Preware patches and a custom kernel (I’m currently running F4 Phantom). And despite those naysayers intent on complaining webOS and TouchPad are light on apps, I haven’t had any trouble finding apps I’ve looked for. And I’ve stumbled across great TouchPad apps too. Spaz HD: Great twitter app despite the odd name! AccuWeather: The same great weather data in an app designed for TouchPad. box: 50GB free cloud storage just for creating your account from your TouchPad! Flickr Mundo HD: Great Flickr app, and gorgeous in Exhibition mode. FlashCards HD: Great study aid. Easy to import cards you find online — I’m using it to study for a professional exam. Kindle: To read your Kindle books. Be forewarned the Kindle icon you see on your newly purchased TouchPad is just a link to the HP Store — you still need to download it! If you’re a new TouchPad owner (and even if you’ve had your TouchPad for a while), I can’t recommend highly enough James Kendrick’s TouchPad optimization article on ZDNet. He’s posted several TouchPad articles, all well worth your time. All in all, the TouchPad is a very good tablet made even better by webOS. If you’re fortunate enough to find one, I say go for it! After picking up my Sprint Samsung Galaxy Tab last weekend (see my initial impressions post), I’ve had a chance to play and get some interesting apps loaded. Since I’ll primarily be using the Tab at home, you won’t see driving or navigation apps listed below. Also most apps are not specifically designed for tablet unless noted. Kindle: The Tab form factor makes it an excellent ebook reader, and I find the Kindle app pleasant to use. Another benefit of the Kindle app? Ability to download free ebooks from Amazon – some are basic fiction, but sometimes there are some nonfiction gems – list available here: Limited-Time Offer ebooks. So, there you have it… my favorite Android apps & online resources for Tab to date. If you’ve found some good apps / references, please leave a comment to let me know! If asked a week ago, I’d have said the Samsung Galaxy Tab was the product I was least likely to buy. Although it looked interesting, I couldn’t understand why someone would buy a 7” tablet. Really, why? Still, I’d been reading positive articles about the Galaxy Tab by James Kendrick and was intrigued. To learn more, I went to try the Galaxy Tab hands on. It’s a solid, well-built device with a beautiful, responsive touchscreen. I watched a YouTube video and surfed the web. Easy to handle. Text displayed clearly & crisply. I liked it, but wasn’t too sure about buying it @ $399 with 3G contract. Huawei Ideos S7 7” tablet: Interesting feature set on paper (including Android 2.1), but I found the resistive touchscreen to be frustrating and not worth $299. Screen wasn’t responsive enough, and I didn’t like pressing so hard to activate a function. Velocity Cruz 7” tablet: Another 7” tablet, but this time running Android 2.0. Build quality seemed cheap. Not compelling enough to spend ~$300. Archos 7 Home Tablet: Cheaper than other 7” tablets at $199, and apparently running Android 2.1. However, read reports of poor WIFI connectivity. Why is it named the “Home Tablet”? Based on some reviews, apparently due to poor battery life. Before buying a Tab, I revisited the iPad as ebook reader. I love the iPad for bringing tablets to the masses, but find it uncomfortable to curl up with like a book. 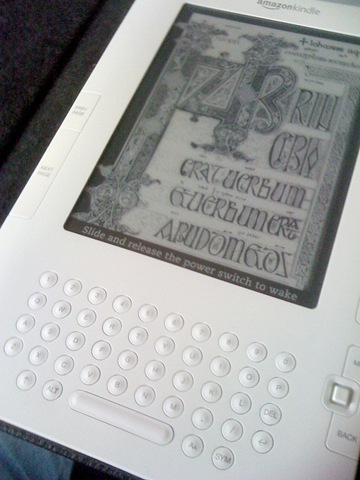 As an eReader, it is simply too big despite its other qualities. Aside from the quality of the device itself, what finally compelled me to buy the Tab? RadioShack’s Sprint Galaxy Tab $350 sale (11/21 – 11/24/2010). I went with the 2GB $29.99 data package since I’ll generally use the Tab at home. Now that I’ve had the Tab a few days, I’m finding I enjoy it even more than expected. I’m reading Keith Richards’ autobiography, Life, on the Kindle for Android app. I’m keeping up with news via the WSJ, NY Times, and Financial Times Android tablet apps. I’m reading PriusChat and AndroidCentral forum posts on the Tapatalk Pro app. I’m reading Twitter posts via the Toiuteur Premium app. 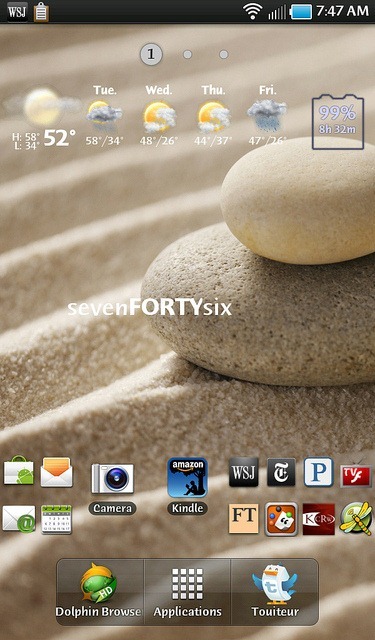 I added the Clockr Evolution text clock widget. I’ve played chess on the SparkChess HD Lite android tablet app (requires Adobe Air) and honed my Angry Birds gameplay skills. I’ve taken screenshots by pressing the Back and power buttons simultaneously. I love the apps that are configured for tablet display but haven’t had seen any display issues for apps not specifically intended for Android tablets. For my usage scenarios (ebook reading and couch surfing), the Tab is perfect. Comfortable to hold with a crisp, easy to read screen. If your use scenarios are similar to mine, definitely recommend the Tab as an option. 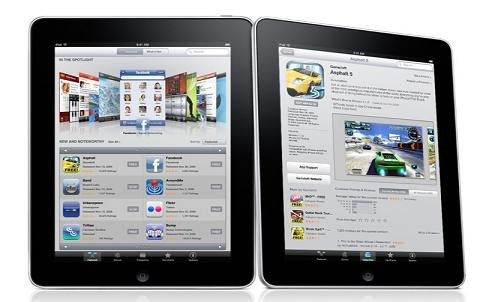 I love my iPad 3G, it’s a pleasure to use. While iPad apps aren’t as numerous as those for iPhone/iPod Touch (yet), I’ve found some worth recommending. Note: Links point to iTunes. As with Twitter apps, I have found some good options but am hoping there continue to be improvements in this space. ABC Player: Love being able to catch up on some great TV on my iPad: LOST! What cool iPad apps have you found? Add a comment to share your recommendations. 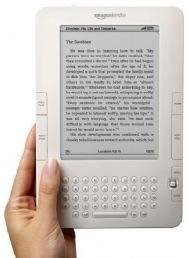 In June 2008, I posted an article entitled Kindle: Still too expensive at $359. I shunned the original Kindle as too expensive and frankly, too ugly. As much as I love books and reading, I couldn’t imagine spending $359 for a device that looked so dated. There, I’ve said it. Even with my affection for shiny, new gadgets, what’s on the inside counts but what’s on the outside counts, too. 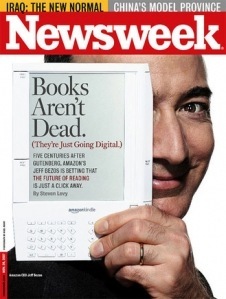 Flash forward eight months to February 2009, when the Kindle 2 was announced…. Suddenly, what I’d previously thought was overpriced became quite compelling. Was it the addition of text to speech? Was it the prettier design? Was it the influence of my Kindle-owning friends? Those answers and more below, in my initial impressions as a Kindle 2 owner. Solid, quality construction: My initial impression upon removing the Kindle from its shipping carton was, “Wow, this is really solid.” Of course, it requires the same care in handling as any electronic device. However, it’s thin but doesn’t feel fragile. Text to speech: It doesn’t quite sound natural but yet isn’t so digitized as to be unlistenable. This feature will be handy for those times when my eyes are tired from gazing at a computer screen. Intuitive navigation: I confess, I took a quick look at the user guide but didn’t pay attention to navigation instructions. I just picked up the Kindle 2, and started using it. The screen: Crisp and easy to read. It has a matte (not glossy) finish to reduce glare when reading outside. On board dictionary: What reader doesn’t at times encounter a word they’d like defined? With the on board New Oxford America Dictionary, one doesn’t even have to put down the book to look up a definition. Nice! Amazon’s eBook selection: I’m a long-time Audible.com (audio book service) subscriber. As wonderful as Audible.com is, sometimes I want a book that’s just not available in audio format. Enter Amazon’s Kindle book store which offers great variety, and pricing (many at $9.99) is still far less than buying the physical book. 3G wireless connectivity without monthly subscription: Considering the cheapest cellular data plans cost an average of $20 to 30 per month, the Kindle’s always on wireless helps justify the device’s pricing. Of course, this always on wireless has its benefits for Amazon – it makes it incredibly easy to buy books. Variety of Kindle newspaper subscriptions is too limited and most are too expensive considering their digital format: I set up a Kindle subscription to The Irish Times since I love the perspective non-U.S. press offers and I thought the subscription pricing was reasonable at $5.99 per month. I love the Wall Street Journal but my current annual online subscription costs less than twelve times the Kindle WSJ $9.99 monthly subscription – I’ll keep my web-based version, thanks. And, frankly, that’s all I can think of that I’d change. I am delighted with the Kindle 2, and very impressed with its quality and the attention to detail that has gone into its design and implementation.